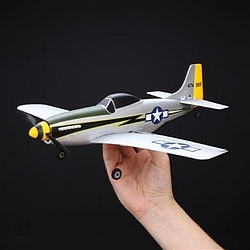 The RC Mustang: The Most Popular Scale Model Aircraft. 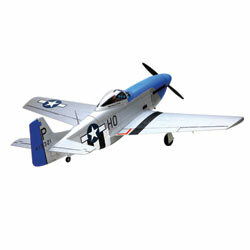 The RC Mustang is available in all sizes of scale model airplanes. From the smallest park flyer to the large scale RC planes, there is a model for you! The P-51 Mustang has to be one of the most popular, if not the most popular scale RC airplanes ever! It is available in many sizes and complexities, from the most simple to the scale masterpiece and everything in between! It makes such a good model, with its gently tapered wing and generous tail area. The wide tracked landing gear, which is available as a retractable type, can be made very reliable. .The cowl can usually hide most RC engines and the detail can be added to suit the most ardent scale fan. There is a wealth of information available on the P-51. Just google "P-51" and you will see what I mean. I will include a link to the Wikipedia site as it always has good information and is usually very accurate. This link is full of good detail shots and is well worth a visit. This site is also full of good detail shots and it looks as if this plane has live ammunition! Bob Banka's Aircraft Documentation has all the 3-views and photos you will need. Take a look. This offering from Top Flite is up to there usual high standards .Of conventional balsa and ply construction, it does come complete with good quality, mechanical, retracts. The covering material is Monokote and Top Flite reckon on 18-25 hours assembly time. A painted aluminum spinner is included along with a finish painted, fiberglass oil cooler and cowl. The retracts are already installed in the wing, as are the flaps. 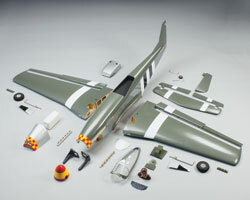 A set of dummy exhaust pipes are included along with a detailed cockpit and a pilot figure. 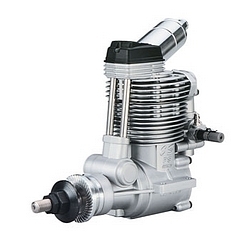 The recommended RC engines are either a 60 2-stroke or up to a 1.20 4-stroke. I think that a 1.20 is a bit on the large size and would say that a .91 4-stroke should be more than adequate. Note that by clicking on the Tower Hobbies logo, you will find yourself on the appropriate page of the Tower Hobbies web site. We receive no commission, if you were to buy and offer this as a service to our visitors. We have purchased from Tower and have always received great service. Here you will find the manual, well worth a look. Here is the O.S. FS-91 4-stroke. This would make an ideal RC engine for the RC Mustang 60. O.S. invented the 4-stroke RC plane engine a number of years ago and have been improving the breed ever since! The FS-91 is easy staring and powerful and the 4-stroke noise it produces, will make the P-51D appear even more realistic. Hangar 9 P-51D Blue Nose 60 ARF. 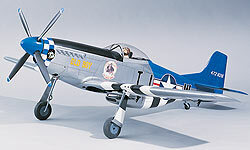 This RC Mustang is almost identical, size wise, to the Top Flite version described above. The Hangar 9 version is a bit more expensive but may very well be worth it. More details of the P-51 D may be found here. With a wing span of 15.8 inches and an all up weight of 1.22oz, this is the smallest RC Mustang that we have taken a look at! Visit this page for more details and/or to buy. This is a beautiful 1/5 scale RC Mustang, that comes as an ARF RC airplane. Visit this page for more details and buying information. 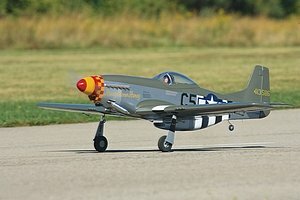 For those of you who love giant scale RC and especially the Top Flite P-51 Mustang ARF, featured above but love to build from model airplane kits, then Top Flite do offer a real kit for the 1/5 scale p-51D. 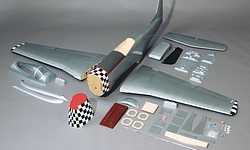 This RC Mustang features conventional balsa and ply construction and of course it can be finished in your preferred method and the color scheme can be whatever you desire. At least you can finish up with a unique looking model that does not look like every other Mustang at the field! The specifications are identical to the ARF described above. The Robart retracts will fit right in and a cockpit kit is available. A look at the product manual will give you a good idea of the work involved.